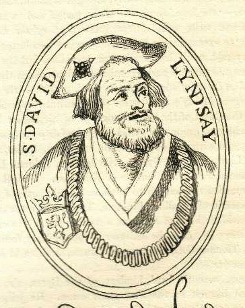 Scottish poet and key figure of the Scottish Enlightenment, was the son of David Lyndsay of the Mount, near Cupar-Fife, and of Garmylton, near Haddington. His place of birth and his school are undetermined. It is probable that his college life was spent at St. Andrews university, on the books of which appears an entry "Da Lindesay" for the session 1508-09. He was engaged at court, first as an equerry, then as an "usher" to the young Prince James, afterwards James V. In 1522 he married Janet Douglas, a court seamstress, and seven years later was appointed Lyon King of Arms, and knighted. He was several times engaged in diplomatic business (twice on embassies abroad -- to the Netherlands and France), and he was, in virtue of his heraldic office, a general master of ceremonies. After the death of James V, in 1542, he continued to sit in parliament as commissioner for Cupar-Fife; and in 1548 he was member of a mission to Denmark which obtained certain privileges for Scottish merchants. There is reason to believe that he died in or about 1555. Most of Lyndsay's literary work, by which he secured great reputation in his own day and by which he still lives, was written during the period of prosperity at court. In this respect he is unlike his predecessor Gavin Douglas, who forsook literature when he became a politician. The explanation of the difference is partly to be found in the fact that Lyndsay's muse was more occasional and satirical, and that the time was suitable to the exercise of his special gifts. It is more difficult to explain how he enjoyed a freedom of speech which is without parallel even in more secure times. He chastised all classes, from his royal master to the most simple. There is no evidence that he abjured Catholicism; yet his leading purpose was the exposure of its errors and abuses. His aid was readily accepted by the reforming party, and by their use of his work he shared with their leaders throughout many generations a reputation which is almost exclusively political and ecclesiastical. Lyndsay's longer poems are The Dreme (1134 lines), The Testament and Complaynt of the Papynago (1190 lines), The Testament of Squyer Meldrum (1859 lines), Ane Dialog betwix Experience and ane Courteour of the Miserabyll Estait of the World (6333 lines), and Ane Pleasant Satyre of the Thrie Estaitis (over 4000 lines). These represent, with reasonable completeness, the range of Lyndsay's literary talent. No single poem can give him a chief place, though here and there, especially in the last, he gives hints of the highest competence. Yet the corporate effect of these pieces is to secure for him the allowance of more than mere intellectual vigor and common sense. There is in his craftsmanship, in his readiness to apply the traditional methods to contemporary requirements, something of that accomplishment which makes even the second-rate man of letters interesting. Lyndsay, the last of the Makars, is not behind his fellow-poets in acknowledgment to Chaucer. As piously as they, he reproduces the master's forms; but in him the sentiment and outlook have suffered change. His nearest approach to Chaucer is in The Testament of Squyer Meldrum, which recalls the sketch of the "young squire"; but the reminiscence is verbal rather than spiritual. Elsewhere his memory serves him less happily, as when he describes the array of the lamented Queen Magdalene in the words which Chaucer had applied to the eyes of his wanton Friar. So too, in the Dreme, the allegorical tradition survives only in the form. "Remembrance" conducts the poet over the old-world itinerary, but only to lead him to speculation on Scotland's woes and to an "Exhortatioun to the Kingis Grace" to bring relief. The tenor is well expressed in the motto from the Vulgate -- "Prophetias nolite spernere. Omnia autem probate: quod bonum est tenete." This didactic habit is freely exercised in the long Dialog (sometimes called the Monarche), a universal history of the medieval type, in which the falls of princes by corruption supply an object lesson to the unreformed church of his day. The Satyre is more direct in its attack on ecclesiastical abuse; and its dramatic form permits more lively treatment. This piece is of great historical interest, being the only extant example of a complete Scottish morality. It is in respect of literary quality Lyndsay's best work, and in dramatic construction and delineation of character it holds a high place in this genre. The farcical interludes (in places too coarse for modern taste) supply many touches of genuine comedy; and throughout the play there are passages, as in the speeches of Veritie in the First Part and of Dame Chastitie in the "Interlude of the Sowtar and the Taylor," in which word and line are happily conceived. The Testament of the Papyngo (popinjay), drawn in the familiar medieval manner, is another tract for the time, full of admonition to court and clergy. Of his shorter pieces, The Complaynt and Publict Confessions of the Kingis Auld Hound, callit Bagsche, directit to Bawtie, the Kingis best belovit Dog, and his companyeonis, and the Answer to the Kingis Flyting have a like pulpit resonance. The former is interesting as a forerunner of Burns's device in the "Twa Dogs." The Deploratioun of the Deith of Queen Magdalene is in the extravagant style of commemoration illustrated in Dunbar's Elegy on the Lord Aubigny. The Justing betwix James Watsoun and Jhone Barbour is a contribution to the popular taste for boisterous fun, in spirit,. if not in form, akin to the Christis Kirk on the Grene series; and indirectly, with Dunbar's Turnament and Of ane Blak-Moir, a burlesque of the courtly tourney. Lyndsay approaches Dunbar in his satire The Supplicatioun in contemptioun of syde taillis ("wide" trains of the ladies), which recalls the older poet's realistic lines on the filthy condition of the city streets. In Lyndsay's Descriptioun of Pedder Coffeis (pedlars) we have an early example of the studies in vulgar life which are so plentiful in later Scottish literature. In Kitteis Confessioun he returns, but in more sprightly mood, to his attack on the church. In Lyndsay we have the first literary expression in Scotland of the Renaissance. His interest lies on the theological side of the revival; he is in no sense a humanist, and he is indifferent to the artistic claims of the movement. Still he appeals to the principle which is fundamental to all. He demands first-hand impression. He feels that men must get their lesson direct, not from intermediaries who understand the originals no more "than they do the ravyng of the rukis." Hence his persistent plea for the vernacular, nowhere more directly put than in the Dialog, in the "Exclamatioun to the Redar, toucheyng the wrytting of the vulgare and maternall language." Though he is concerned only in the theological and ecclesiastical application of this, he undoubtedly stimulated the use of the vernacular in a Scotland which in all literary matters beyond the concern of the irresponsible poet still used the lingua franca of Europe.